Share "A New Bathroom for a New Year"
While most of us use spring and summer to focus on outdoor projects and lawn maintenance, winter can be a great time to turn your attention indoors. 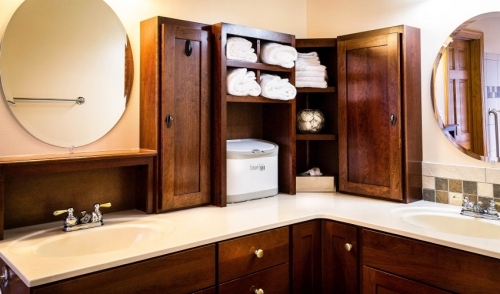 This winter, why not take on a bathroom remodel as your New Year’s resolution! We often see our clients turn a blind eye to indoor projects; and whether you are a long-time or first-time homeowner, these undertakings may seem too daunting to even think about. We feel confident, however, that with our help, ample planning and a little determination from you, you will come to find that these projects are completely within your grasp. 1. If you had the pleasure of taking apart your bathroom, where might you start? We suggest the outdated tiling lining many a floor and shower—our clients often come to us about this particular eyesore first. For this part of your project, you will most certainly need a tile cutter—a tool most people don’t just have lying around the garage. Not only can we provide you with one, our friendly staff is happy to instruct you on proper use of those tools you may not be accustomed to operating. 2. Your next thought might be to take out that age-old soaker tub and use the new space to build a linen closet. For a task like this one, you will need to consider putting up a new wall in the bathroom. This will require several tools, including a drywall lift and sander, a nail gun, and a stable ladder, all of which we can provide. 3. Finally, with your new closet in place, you may concede that your space lacks a little Feng -shui. Perhaps your toilet would be better placed about four feet to the right of its current location. We also rent the tools that will help you realign and run your water and waste lines! While these are only three ideas to get you started, our staff would be more than happy to help make your vision for your new bathroom come to life. Avoid the costs of sourcing the job to a contractor and gain the satisfaction of accomplishing a successful remodel on your own this year! © 2019 Taylor True Value Rental of Wellesley, MA. All rights reserved.